Hi there! 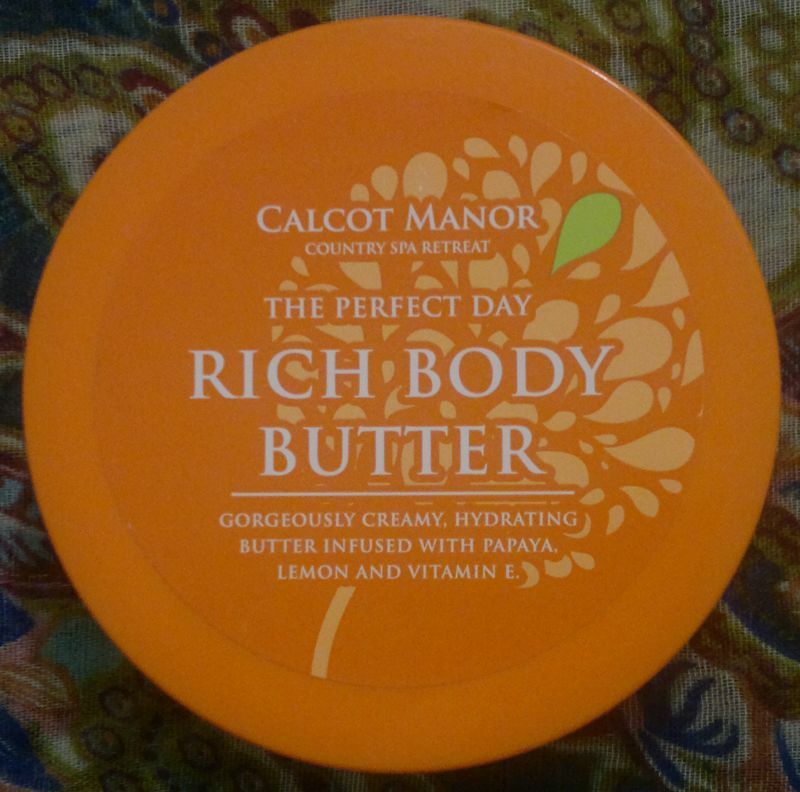 Today’s post is about Calcot Manor’s The Perfect Day Rich Body Butter. This body butter claims to “melt effortlessly into skin” and to “leave a gorgeous, scented glow”. A quick scan of the ingredients revealed that this body butter contains quite a few natural ingredients – i.e. sunflower seed oil, bitter orange flower extract, fig extract, green tea leaf extract, rose flower extract, papaya fruit extract, etc… This sounds promising! Now let me tell you if this body butter is any good! I think this body butter is very hydrating. It feels rich – but it doesn’t leave my skin feeling sticky. I like it! However, I don’t think my skin looks any different. There’s definitely no glow. In addition, this body butter doesn’t smell gorgeous at all. I can detect a faint lemony fragrance – and that’s all there is. Would I recommend this body butter? Yes and no. I will finish this body butter, but I wouldn’t repurchase it. And if you want a lovely smelling body butter, keep looking! However, if you want a rich (yet non-sticky) body butter, give this one a sniff. If you’re OK with the fragrance, you might be happy with this product. Calcot Manor’s The Perfect Day Rich Body Butter is available as 250ml. Prices vary greatly – depending on where you shop. I paid 99p for this product (bargain store), but I’ve also found an online shop that sells this body butter for just under £10. So make sure you compare prices online before you buy! Hi there! Just a few days ago I told you how much I liked Calcot Manor’s De-Stress Body Buff. 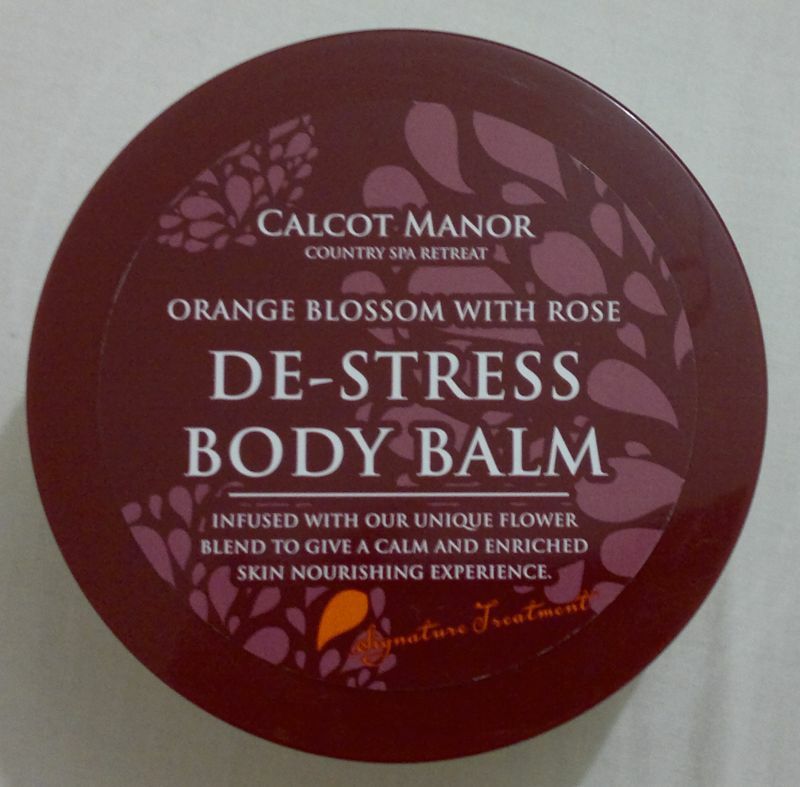 So I thought it’s time to have a closer look at Calcot Manor’s Orange Blossom With Rose De-Stress Body Balm. At first let me say that this body balm has the same old-fashioned floral fragrance as the body buff. It won’t be everyone’s favourite. But I think this fragrances is very charming. Now let’s get to the actual product! Compared to other body lotions or body butters, this moisturiser isn’t the easiest to work with. I think this is because of the rich formula. So if you want a moisturiser that doesn’t take more two minutes to apply all over your body, this isn’t the one for you. What I really like about this body balm is how deeply moisturising and calming it is. It’s really good! And I can still feel it when I have a shower the next day: My skin feels totally different – in a very good way. I can’t describe it because I’v never experienced anything like it with any other moisturiser. All I can say is that you might want to try it yourself. Calcot Manor’s De-Stress Body Balm is available as 200ml for about £4, and 500ml for about £7 at Tesco’s. However, some of Calcot Manor’s products have hit the discount stores. I paid 99p only for my 200ml body balm – at a discount store! Hi there! Today I’m reviewing Calcot Manor’s De-Stress Body Buff. A while ago the luxurious Calcot Manor Spa teamed up with Tesco to come up with a spa-themed product range. Some of these products have now hit the discount stores, so I bought quite a few of them. The first product I wanted to try was this body buff. So I tried it! The first thing I noticed was the product’s fragrance. I’d describe it as a beautiful old-fashioned floral fragrance. My husband is not impressed. But I think the scent is gorgeous! But to me the big selling point is that the product is easy to distribute all over my body – almost like a shower gel. I think sugar scrubs can be quite a pain to use – but exfoliating my skin with this body buff is quick and easy. I think this product is really good and I can definitely recommend it! The scent isn’t for everyone, and I would have expected it to be fresher and more youthful. But I actually like the strong vintage floral fragrance because it fits the traditional English spa theme. Calcot Manot De-Stress Body Buff is available as 200ml for £4.99 at Tesco. However, I paid 99p at a discount store!